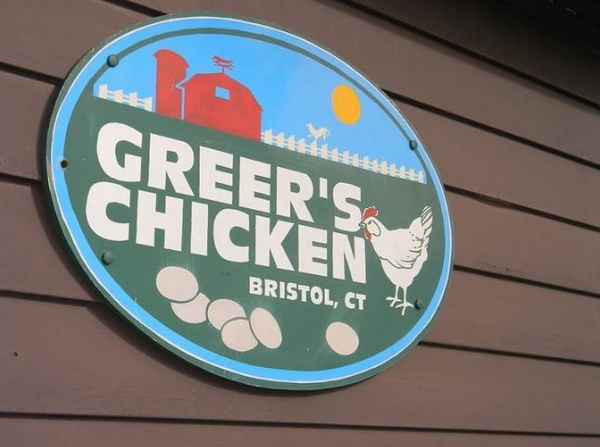 BRISTOL - Find the comforts of Southern fried chicken and home-styled salads at Greer’s Chicken, which was awarded “Best Fried Chicken” in 2011, 2012 and 2016 by Connecticut Magazine. A local favorite, this hidden gem is located at 64 Matthews St., in Bristol. With no indoor dining, Greer’s is ideal for take-out, or on a beautiful day, enjoying the picnic area out on the side of the building. Greer’s also offers catering, which is a perfect choice for graduations, birthdays, stags or parties for any occasion. Rich Plantamuro, owner of Greer’s for 30 years, is proud of the history. Greer’s satisfies all chicken cravings one could have. Munch on buffalo and honey BBQ wings, savor some chicken nuggets or dive right in to an assortment of Southern fried chicken, including breasts, drumsticks, thighs and wings. Plantamuro states that the most popular item on the menu is the chicken chunks, a freshly cut, hand-breaded nugget. Looking for some scrumptious sides? Greer’s offers plenty of options; French fries, sweet potato fries, deep fried mushrooms, onion rings, jalapeno poppers and pickles. Enjoy a hearty serving of mashed potatoes and warm, thick gravy or feast on a refreshing garden salad, cole slaw, potato salad and two different kinds of macaroni salad. Also, don’t forget to try their famous and delicious baked beans. Need something sugary for your sweet tooth? Delight yourself in a variety of cakes including chocolate, cheese or carrot. Greer’s also offers Swiss Miss puddings. For more information visit their website at www.greerschicken.net , its Facebook page at www.facebook.com/greerschicken , or call 860-583-3191. Posted in The Bristol Press, General Business, on Tuesday, 26 March 2019 19:50. Updated: Tuesday, 26 March 2019 19:53.